The people of Ursa, Shell’s $1.45 billion oil-and-gas platform, live 65 miles offshore, in an environment that is demanding and dangerous, and that could drive them crazy. Here’s how they work — and how they cope. This story was originally published in September 2000, but it offers an insight into a aspect of the Gulf oil spill coverage that’s been overlooked in recent coverage: life on board an oil rig — in this case, Shell Oil’s Ursa platform (above). At the time of original publication it was a brand new, state-of-the-art operation. No, this is not a personalized wake-up call from a soft-spoken hotel operator. It’s a different kind of reveille, one that begins with a brisk knock at the door, continues with that chirpy greeting, and ends with the overhead fluorescent lights flipping on. It’s the way that every day starts on Ursa, Shell Oil’s newest production-and-drilling platform in the deep waters off the coast of Louisiana. And if that greeting doesn’t get you up, a personalized call may go out over the loudspeaker, telling you to get out of bed and get down to the galley. One hour later, at 6 a.m., a staff meeting begins with a group of workers ambling in, dressed in baseball caps and shirts with name patches that read “Maxie,” “Boots,” “Buster,” and “Princess.” Some of the workers sport monogrammed overalls. Until the meeting comes to order, the only conversation is intense trash-talking about an impending platformwide Ping-Pong tournament. Nothing in such friendly banter would suggest that this wisecracking bunch is in charge of an oil-and-gas platform that cost $1.45 billion to build and is the size of two football fields. But the cost is only one part of the equation: Deep-water drilling is also enormously complex, with a number of workplace constraints — some technological, some human. As a consequence, the men and women of Ursa, about 250 people who went through a rigorous audition process to make the cut, need to be a special breed. The job demands that employees work long hours in close quarters, do demanding and sometimes dangerous work without driving one another crazy — or else go nuts themselves. How do they do it? Ursa operates 24 hours a day, 365 days a year. With oil currently selling at around $30 per barrel, and Ursa producing about 100,000 barrels of oil per day, it doesn’t make economic sense to unplug the operation — as long as everything is functioning smoothly. The challenge, of course, is for everything to function smoothly. One mistake, and Ursa could join the Exxon Valdez in the oil-and-environmental-disaster history books. Those challenges are something that Rick Fox, Shell’s asset leader for Ursa, knew three years ago when he set out to assemble the team that would help build and staff the platform in preparation for “first oil” in March 1999. Building a better workplace began with the way that the platform was designed. Thanks to space-age three-dimensional design software, Fox and his team were able to participate in the design process in finer detail and at an earlier stage than his predecessors were able to on similar projects. “For example, we were able to think about how we wanted to walk around a particular piece of equipment as we inspected it, and we were able to design that in ahead of time,” says Sam Mabry, a 39-year-old control-room operator on Ursa. “That sort of thing makes a big difference once you’re out there working.” Another improvement that got designed into the platform’s environment: enough space so that drillers, operations people, and production workers could all have their own data rooms. An even greater challenge was to match people to the platform. 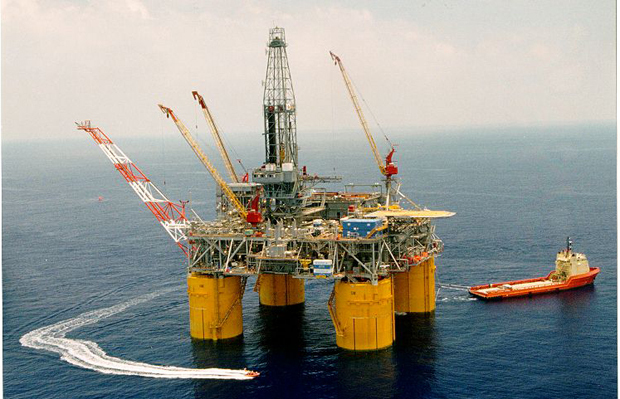 Executives at Shell made it clear that Ursa could not be staffed simply by reassigning the most experienced workers from the company’s three other tension-leg platforms. So it was up to Fox and his team to find and then to evaluate candidates who had little prior experience in the energy business. “To us, that just created an opportunity to bring in people from elsewhere who could add value to the system because they didn’t see things the way we saw them,” says Arthur McAlpin, 44, one of two on-platform managers who report directly to Fox, whose office is in New Orleans. While many people did transfer out to Ursa from Shell operations onshore, others had most recently worked on submarines, repaired cardiac equipment, and trolled the shopping aisles of Home Depot. The helicopters leave every Tuesday from Venice, Louisiana for the 45-minute trip to Ursa, carrying out the new workers who are starting a shift, bringing back those who’ve completed one. At any given time, there are roughly 120 workers out on the platform. Most of them work a 14-day shift on Ursa, then take 14 days off. When they’re on, they work for 12 to 14 hours each day. The day shift and the night shift start their 14-day hitches on alternating weeks. “That way, there’s always someone out there who has been on the platform for at least one week and is aware of any problems,” says Fox. For those who visit it a bit too often, the buffet line creates its own requirement: the need to exercise. Several world-class Ping-Pong players work on Ursa, and foosball is also a popular sport. Thanks to Ursa’s satellite hookup, cable TV is in every room, and Internet access is available in the offices and in the library. While there is no hardship pay for working offshore, entry-level roustabouts on the drilling rig still begin at about $30,000 per year. Since there’s nowhere to spend that money on the platform, many workers gravitate to Internet investing. “A lot of these guys will retire as millionaires if they’re smart,” says John Guyett, 49, a drilling foreman on Ursa. While several workers on Ursa are divorced and are unable to have full custody of their children because of their schedules, the percentage of single parents on Ursa doesn’t appear to be especially high. Male workers (only a handful of women work on Ursa) chalk that up in part to their dutiful completion of the “honey do’s” that pile up while they’re gone: “When we get home, what we hear is ‘Honey, now that you’re back, could you please do the windows!’ or ‘Honey, please do the lawn!’ ” jokes Tommy Chreene, 45, a systems mechanic. Ron Lieber (rlieber@fastcompany.com) is a Fast Company senior writer. Visit Ursa on the Web (www.offshore-technology.com/projects/ursa).